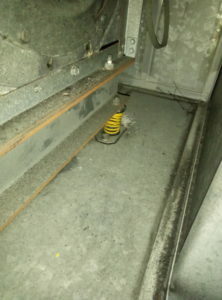 When carrying out a survey on some Air Handling Units (AHUs) at a food manufacturer & processor recently, we came across this scenario; the AHU fan’s anti-vibration mounts had either completely come off or were not installed correctly. With the fan still running and providing good airflow, it can lead you to believe that the system is fine and that it doesn’t need any immediate maintenance. However, small problems like this can lead to much bigger issues in the long run. Why are anti-vibration mounts so important? As we all know, prevention is better than cure. Here at HVDS we can carry out an in-depth mechanical analysis and survey of all your AHU and fan requirements on site, to help you avoid potential costly repairs and maintenance in the future. For more information, get in touch today on 01785 256976 or email info@hvds.co.uk.